Look at these glorious images with all the Indian colors. In a few hours, my Indian friends will begin their celebration ! Happy Diwali! Celebration of Light with candles twinkling in the winter night! 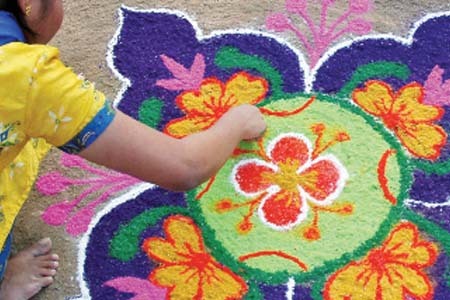 Welcome to the biggest Indian festival, lasting for five days, and filled with color and joy. . . .Diwali. The candles make me think of Hanukkah, Kwanzaa, White Dog Festival ( Iroquois Native American Festival) and Christmas…..light in the winter darkness. 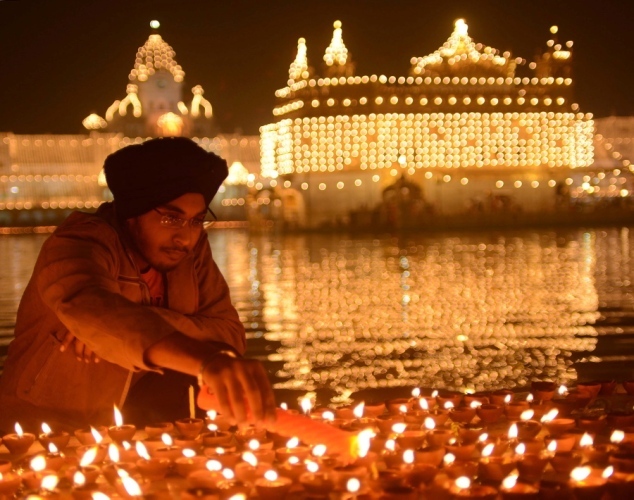 Diwali began as a religious festival to celebrate good overcoming evil, but today it is celebrated by most Indians regardless of religion as a beginning of the New Year. It is the beginning of the Hindu calendar year and is the celebration of blessings, life, and family. It is as important in India as Christmas is in the United States. Preparations begin with shopping: Ah , the vibrant Indian colors. 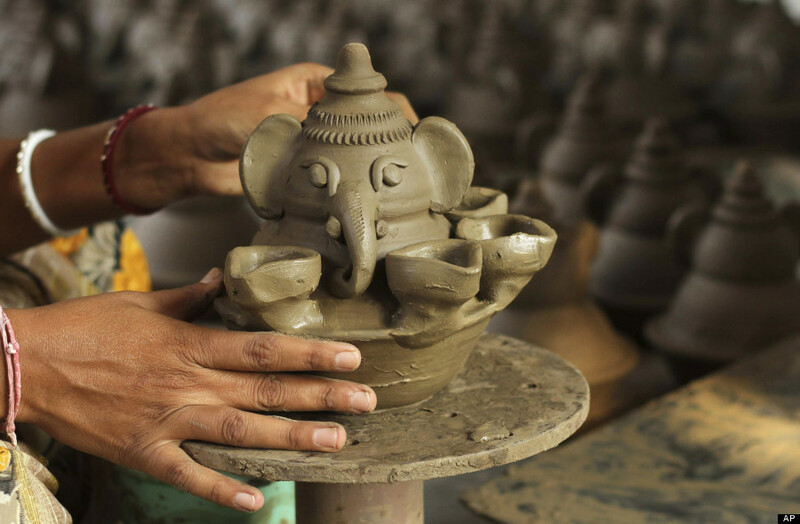 . . . .
Special sweets are purchased. . . .
Ganesha and lights. . . .
New candle holders or lamps in the traditional colors of red and gold. 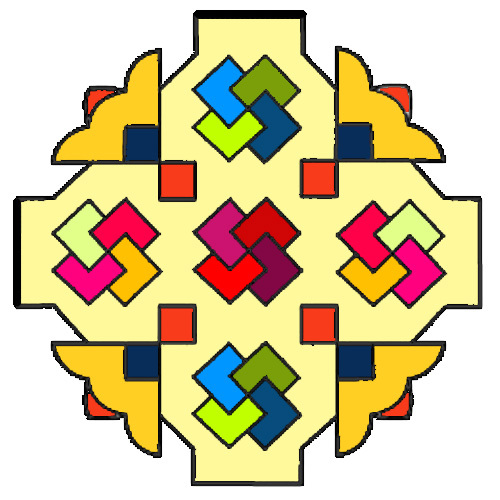 . . . .
Rangoli or welcoming designs made from crushed, colored rice are chosen for the outside of the door to welcome family and friends. . . .
Now to create it. . . .
Decorations in the house or yard. . . . Gifts and greeting cards are exchanged with family and friends. New clothes represent the beginning of a New Year. 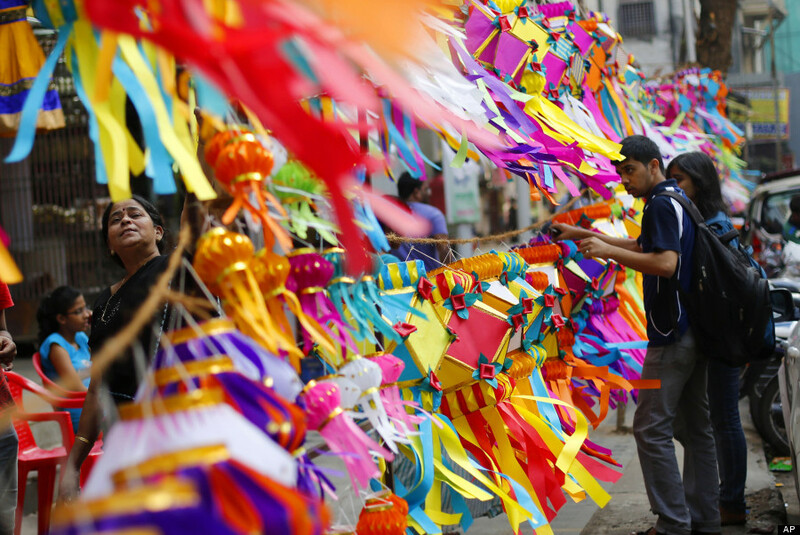 There are religious observances and celebrations of various stories of mythology. Most ares in India celebrate a different myth, but all celebrate good conquering evil. The pictures are so lovely, I couldn’t choose just one! Pictures from Huffington Post and Google Images, Public Domain. Namaste. . . . . . 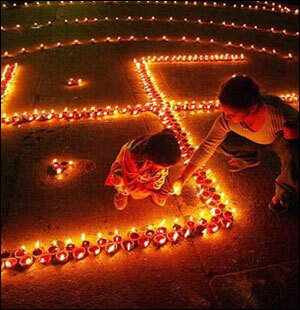 This Is Incredible India Celebrating Diwali! This entry was posted in India, Uncategorized and tagged Cebration of Lights, celebration, colors, Diwali, family, good over evil, Hinduism, joy, New Year, photography, travel. Bookmark the permalink. Lovely . Thank yo so much. 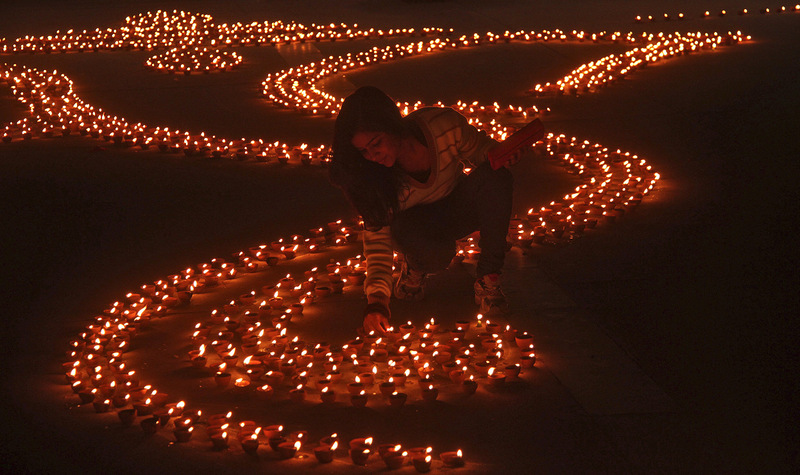 Best wishes to you for a Happy Diwali, too! Beautiful photos. Really enjoyed this. *So beautiful! * I’ve never seen a lovelier and better description of Diwali. 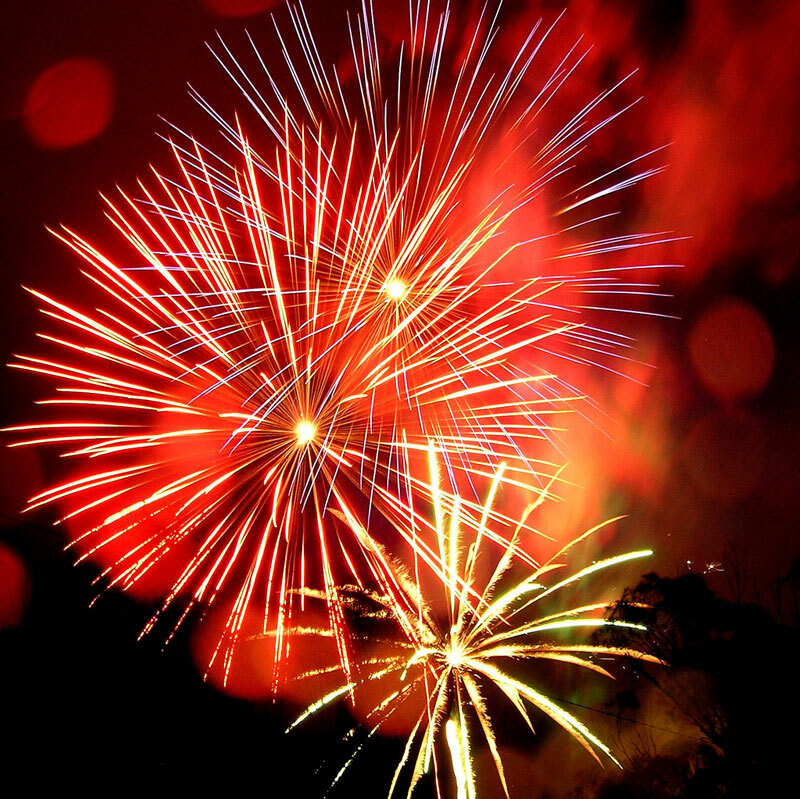 The celebration of light and of good over evil is something we should *all* share. A happy and blessed celebration to you and your loved ones, and may the year ahead be a great joy in every way, my friend! Namaste. What a lovely comment. Many thanks for your generous and kind words. The very best of the holiday spirit to you as well! Namaste. . .
BEAUTIFUL… such great color, and life of this wonderful festival. Doesn’t it look terrific? Nameste! Superbly written and beautiful pics by Anne. 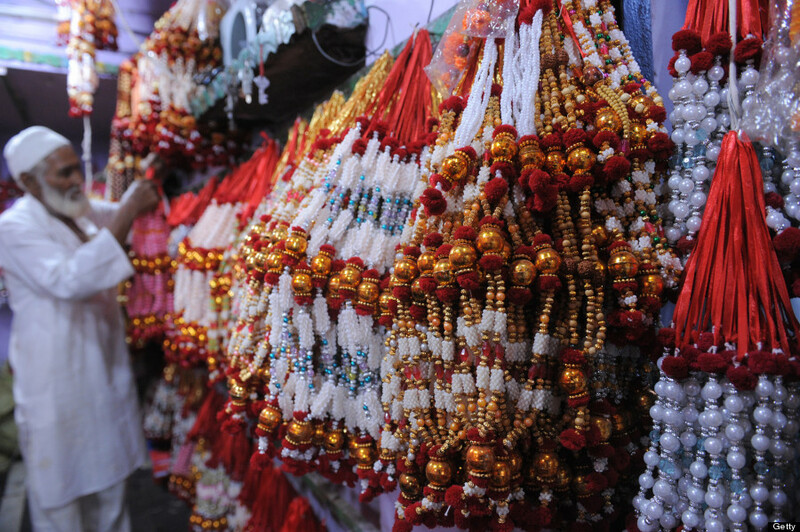 Proud to be from the sub-continent Indian, where all festivals are celebrated with great spirit. Those are true words….I love the Indian spirit! Thanks so much for the reblog, my friend! Diwali..Full of Colors and Lights!!! 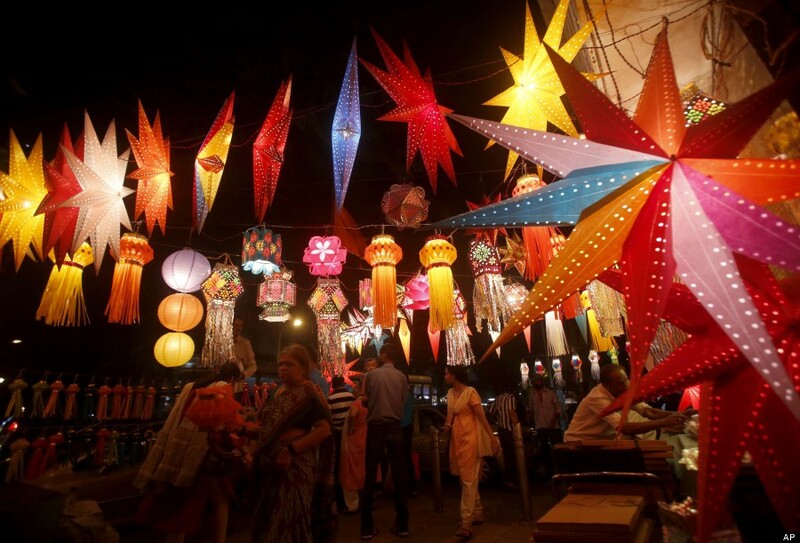 Thanks Anne x for a wonderful blog on Diwali – Festival of India. Happy Diwali Anne..May this Diwali brings you lot of joy and prosperity. 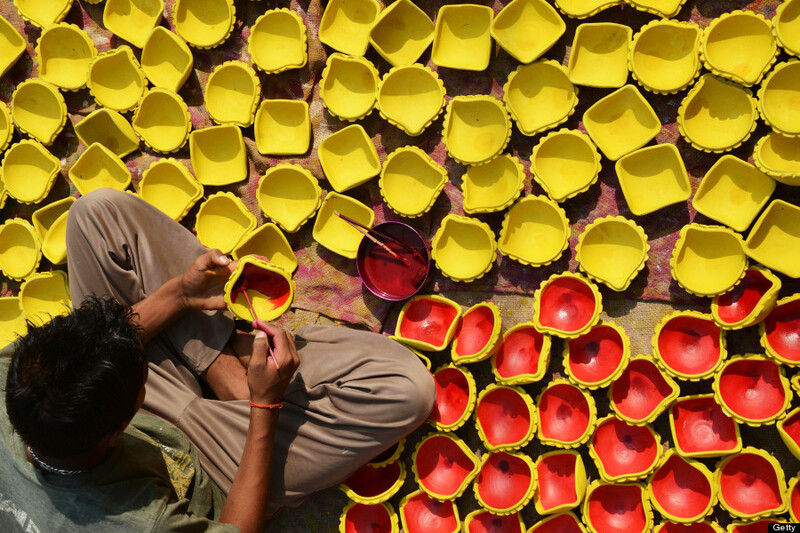 Thanks Anne for a wonderful blog on Diwali – Festival of India. Thank you so much for the reblog, my friend! 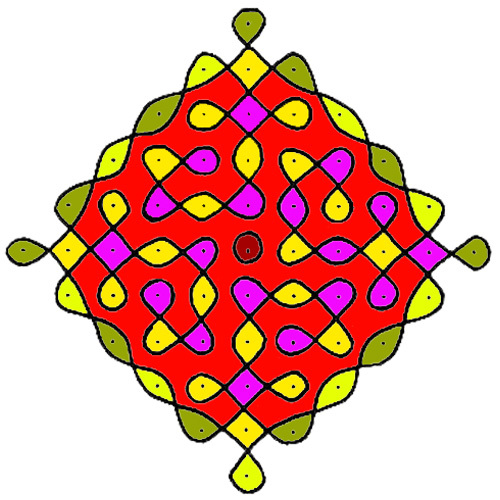 Hope your Diwali was joyful Annet. Actually, I didn’t know that and was hoping someone would explain it. Brava Madhu! Indeed it is. India is just filled with wonderful colors all the time. An amazing place! I am so sorry we were not there during Diwali! But I love the story and the pictures! Namaste. . . . .
Beautiful collections or photographs and colors. Very well written and i just loved going through it and feeling great that Diwali is also popular amongst people differ from indian tradition. Thankyou for covering such a great article. You are most welcome. The photos were from the Public Domain of Google Images. Its Deepavali in real but we short it for Diwali. One of the other bloggers said it depended on the area of the country. I thought Deepavali was used in the south. 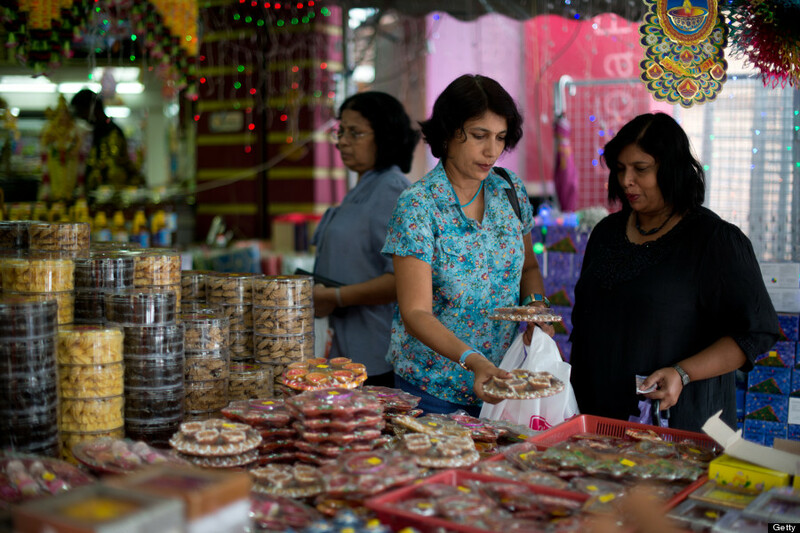 Yeah it is true , south people still call it deepavali…..and there a great story behind why we celebrate this festival. You might have heard about.ramayana and mahabharat, one of the greatest ever mythological stories of india which will let you know why and how most of the festivals are started here. I will have to look those myths up as I am not familiar with them. If you are a reader there is another really good book about slum in Mumbai by an American woman married to an Indian man. BEHIND THE BEAUTIFUL FOREVERS by Katherine Boo. She loves India , too. India is very popular with lots of Americans with the influx of Indian people here to work and live. It all seems very magical and mysterious! Thank you for your kind words! Beautiful pictures, intriguing thoughts….love your blog, your views, love seeing India through your eyes … 🙂 Happy to have found you here !! I love Incredible India ! May I ask if you are Indian? If so where do you live? Namaste. . . .
Hi , my name is Shankari 🙂 I am from Tamilnadu, India. Right now I live inNewJersey, USA. I had just gone to your site…sorry I should have remembered! I know there is a huge Indian community in Jersey. Have you been there for a winter? thanks for descripting Diwali festival in so wondeful way. Pictures are very lovely. I appreciate your passionate love for India. Thanks so much Dimpy, I am glad that you “felt the love!” That is exactly how I feel! Smiles. . . . . . So glad you enjoyed my post and could see how much I truly love India. That is exactly how I feel. Smiles. . . . . I thought I had replied to this. . . I do love India and am so glad that come through in my posts! Thanks for the thank! Have a lovely weekend. . . . .Smiles . . . . . These images are magnificent! Share in the joy of India. . . . Happy Diwali which begins tonight! How beautiful, love the pictures and the description – I may have to post it on my FB page so all my friends can learn and understand the true meaning. Great post! Happy Diwali! Loretta, thank you for your kind words. I would be honored to have you post it on your FB page!